Life Design Event Planning, voted Arizona’s Best Wedding Planner of 2007, would like to invite you to celebrate the launch of our new website and chic look! 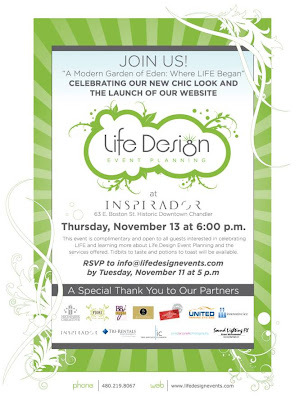 Life Design Event Planning's event of "A Modern Day Garden of Eden: Where LIFE Began," will be held Thursday, November 13th at 6PM. Join us at Inspirador: 63 East Boston Street in Historic Old Town Chandler, for live music, delectable treats, and lots of inspiration to celebrate LIFE. Bring any non-perishable food items and receive a raffle ticket for each item to win prizes! Please consider RSVPing soon as we have limited space available. You can click here to RSVP, and can also click on the invite to view it as a larger picture. I can't wait to unveil the new site & new look, and celebrate LIFE with all of you!